The FTPD-1 is a module with a FT230X USB to UART converter and a dual buffer. 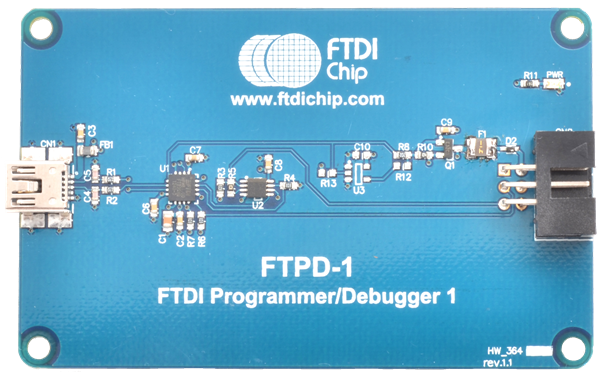 The FTPD-1 utilises these components to generate a single line half-duplex UART signal with no handshake which can be used to program several of FTDI’s MCU devices, predominantly FT51A. This module also provides a switched 5V power supply to the target device and is configured such that it does not infringe USB compliance regulations for supplying bus power. FTPD-1’s board dimensions are the same as a credit card; however the fitted components give it additional height. The module is supplied with a berg connector ribbon cable; however it is compatible for operation with pogo pin cables. Allcomponents used, including the FT230X are Pb-free. Protected by resettable fuse with 0.5 A hold current and schottky diode on the output power line.